I've been dreaming about blackberries for weeks. Granted, we do have them in DC, but something feels special about PNW berries. And when they start to ripen in the late August sun, there is a bittersweet taste that comes of surviving the other ten dreary months and knowing that the grey will return in only a few short weeks. But that is the reality in which Seattle-ites live. On Sunday afternoon, I took a trip down memory lane and went blackberry picking in my parents' neighborhood. Perhaps I should clarify, we moved to the neighborhood when I was 18 months old, so most of my childhood summer memories have their roots in this very location. Despite the suboptimal weather that has shortened and delayed growing seasons along the northwest coast this year, I managed to bring back quite a haul of berries. After consuming not an insignificant number, I decided these pretty tart little beauties were dying for a place in a pie. 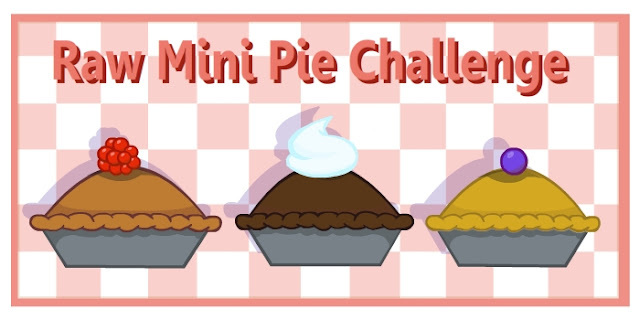 Luckily, Lisa of Vegan Culinary Crusade is still accepting raw pie entries for the mini pie challenge! I also posted this puppy on Simply Sugar and Gluten Free's Slightly Indulgent Tuesdays (it's been a while). 2. Same deal, food process all ingredients until creamy. Layer about halfway into the crust. 3. Toss and let sit for at least 3o minutes (maybe do this first) until getting juicy. Layer into the tart. ENJOY! Are there any places you visit that make you feel like a child again? These look delicious and I would love to make them, but I'm afraid I would make the mixture for the crust and eat it all before I could make it. DELICIOUS combo. What a fantastic entry into the challenge. I love blackberries! It sounds like a dream to be sitting in a backyard munching on a pint of freshly picked ones. Ah...the blissful moments of summer. Can you send me your mailing address. We'd like to get your prize in the mail soon.